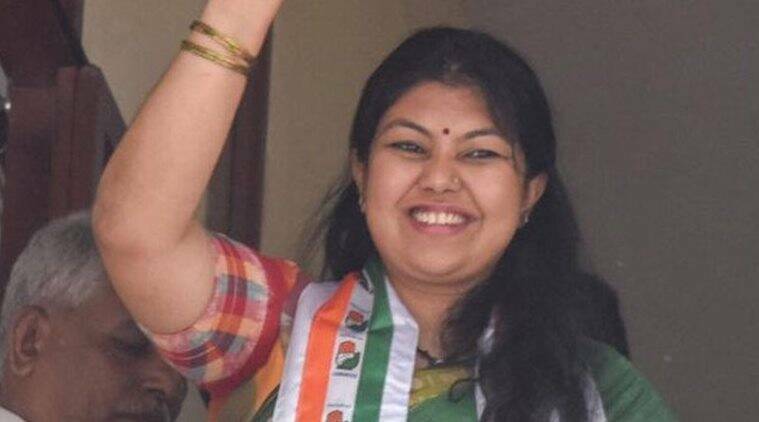 Jayanagar Assembly election results: Congress candidate Sowmya Reddy defeated BJP's B N Prahlad. The Congress defeated the BJP to win the Jayanagar Assembly election seat on Wednesday, taking the party’s tally in the Karnataka House to 79. Its candidate Sowmya Reddy, the daughter of former minister Ramalinga Reddy, defeated BJP’s B N Prahlad by a margin of over 2,800 votes. Elections to the Karnataka Assembly were held on May 12, but due to the death of BJP candidate B N Vijayakumar, elections to this seat was deferred to June 11. Prahlad and Vijayakumar were brothers. The win increases the Congress’ tally in Bengaluru to 15 of the 28 Assembly seats. The JD(S), which had initially fielded Kalegowda for the seat, had withdrawn its candidate and extended support to Sowmya. This was the first election that the parties, which have announced that they will fight the 2019 Lok Sabha polls together, fought together. Jayanagar recorded an estimated 55 per cent voter turnout. There were 19 candidates in the fray. Karnataka Deputy Chief Minister G Parameshwara congratulated Reddy for her win. “A heartfelt thank you goes to the voters who saw the future in @INCKarnataka. With this impactful win, we have now conquered 15 out of 28 Assembly seats in Bengaluru,” he added. The Congress stitched up a post-poll alliance with the JD(S) to come to power in the state on May 15, when counting of votes was held. Congress had won 78 seats, while the JD(S) bagged 37 in the 224-member House. The BJP, which emerged as the single largest party, had won 104. Apart from the Jayanagar constituency, elections to Rajarajeshwari Nagar assembly seat in Bengaluru were also postponed after the Election Commission recovered nearly 10,000 voter IDs from an apartment in the constituency. Results to the seat were announced on May 31. The Congress and JD(S), despite being in coalition by then, fielded their own candidates. Congress’ Munirathna won the seat, leaving the JD(S) candidate to a distant third. However, Congress lost an MLA after the death of Siddu B Nyamagouda on May 28. The Jamkhandi MLA was on his way from Goa to his home district Bagalkot when a truck rammed into his car near Tulasigeri.